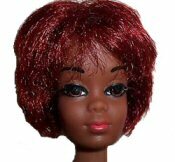 The TNT Julia Doll was made in 1969 for one year. She has a Barbie TNT body and the Christie Doll face/head. She is wearing a white nurse's uniform and cap. Two piece white nurse's uniform with a nurse's pin and buttons on front & sleeves. White nurse's cap with black braid trim. White pilgrim shoes.